Students entering elementary, middle, or high school shall be assigned to the campus that serves the school zone in which their parent/legal guardian resides or in which the student resides as an unaccompanied youth. Exceptions to this campus assignment requirement are made when the student is assigned to another school through the enrollment capping procedure, special program placement, for disciplinary reasons, or when the student is approved for an intra-district transfer or other legally required assignment. Reference FDB(Local). 2. Click on “Find Address” and then TYPE IN YOUR RESIDENTIAL STREET ADDRESS in the box that appears. 3. Next, click “Find Address.” A house will appear on the map. To zoom-in on the house, double-click on the house. Please Note: Results provided here are for informational purposes. Final student placement is verified by the campus registrar. If the “Attendance Zone Map” does not pull up your home address OR to report an error, please call the Office of Student Services at 788-9250. Type in your residential street address in the search bar located in the top right had corner of the map. Click on the arrow located in the top left hand corner of the map to view the legend. Select which school zones you would like to see (elementary, middle, or high) for your address. Zoom in and out to view more attendance zones on the map. Click on the arrows in the top left hand corner of the map to specify which school zones you would like to see (elementary, middle, or high) for your address. 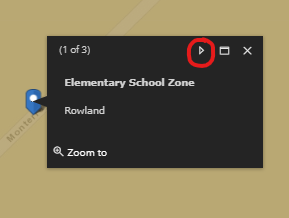 See which campuses (elementary, middle, high) your child(ren) are zoned in by clicking through the arrow within your address box (see below). If the “Attendance Zone Map” does not pull up your home address OR to report an error, please call the Office of Student Services at 361-788-9250.